Author and speaker, Angie Tolpin: Leaving a Legacy, shared a blog post, Redeeming the Division: Cultivating Unity Among Women, that linked to her video from a recent speaking engagement. Angie read a Scripture and made a point that I’d never thought of before. 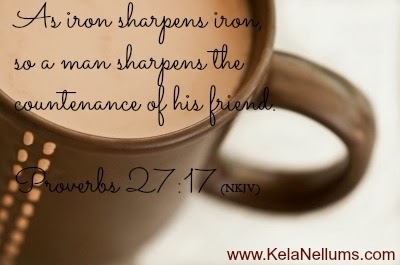 When iron sharpens iron, sparks are gonna fly! In any relationship there are going to be uncomfortable, and some down right, mean times. I’ll be the first to admit that I don’t do well with sparks. Not at all. As I read the entire verse, I realize that the end result should be a smile on my friend’s face. So…sparks are necessary for sharpening? There are a lot of things that cause sparks in friendships. Sometimes those sparks burn deep before they ever go out and stop burning. Those may be the friendships that dissolve without the need to be mended. There is an individual, between-you-and-God kind of sharpening that goes on then. But I want to talk about that friend that doesn’t make a spark to harm you, but to..well..sharpen you. I have those friendships in my sisters and a small (very small) number of others.These are the women that have permission to speak into my life. Sometimes I don’t like when they make a spark and call out my selfishness, pride and wrong thinking. I do appreciate the place they have in my life. It’s needed! SPARKS FLYING isn’t the only thing that Angie speaks about in her message. That’s the part that stuck out most to me! I urge you to listen to…pay close attention and let the Lord speak to you about friendship and redeeming the division.